Following a hot and steamy weekend of racing in the jungle, the dust has just begun to settle after the world’s fastest riders took to the Cairns racecourse Down Under in Australia. For the downhillers, Cairns set the scene for the 2nd round of the World Cup after the muddy madness of Lourdes. 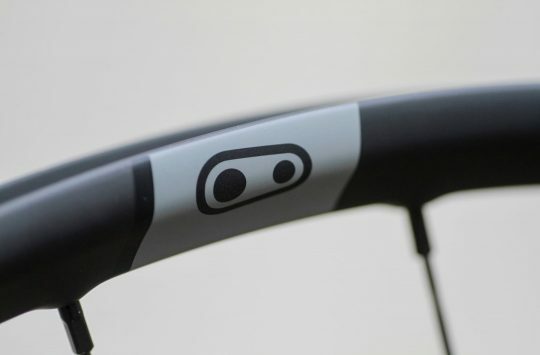 For the XC whippets, this was the first round of the UCI World Cup series, and the beginning of an intense season of racing in the lead up to the World Championships in the Czech Republic in early July, and the Rio Summer Olympic Games in August. Known for its rocky features, steep pinch climbs and fast descents, the Cairns cross-country course provided the ultimate battle ground for the XCO field. 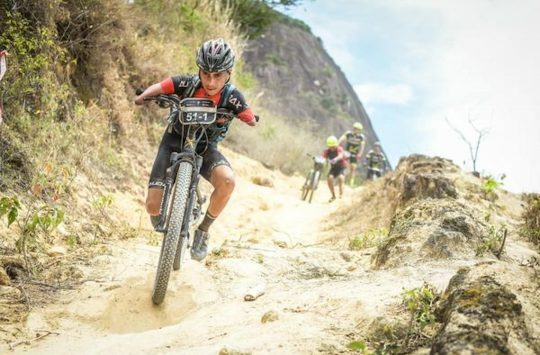 Riders would need to have their technical wits about them, as well as plenty of oxygen in the lungs to make it through the dense rainforest ascents. Each 4.3km lap featured 158m of vertical climbing in a tight racecourse that required plenty of power where it counted, and the necessary hydration and stamina to keep the muscles ticking over all the way to the finish line. For the Elite Women’s race, some light rain threatened to change the course surface and had many coaches and team managers worrying about the muddy Cairns nightmare of 2014. Fortunately the rain stayed away, though along with the near-30 degree temperatures under the hot Australian sun, it made for sticky conditions that would challenge those coming from cooler climates. Australia’s Rebecca Henderson was the clear spectator favourite, and she led out from the start gun to deafening roars and cheers from the boisterous home crowd. It wasn’t long before Specialized Racing’s Annika Langvad took control of the race, leading out and dominating the technical descents with incredible speed and confidence. Langvad went on to take a convincing victory ahead of Focus XC Team rider Linda Indergand, who crossed the line just 10 seconds behind Langvad. 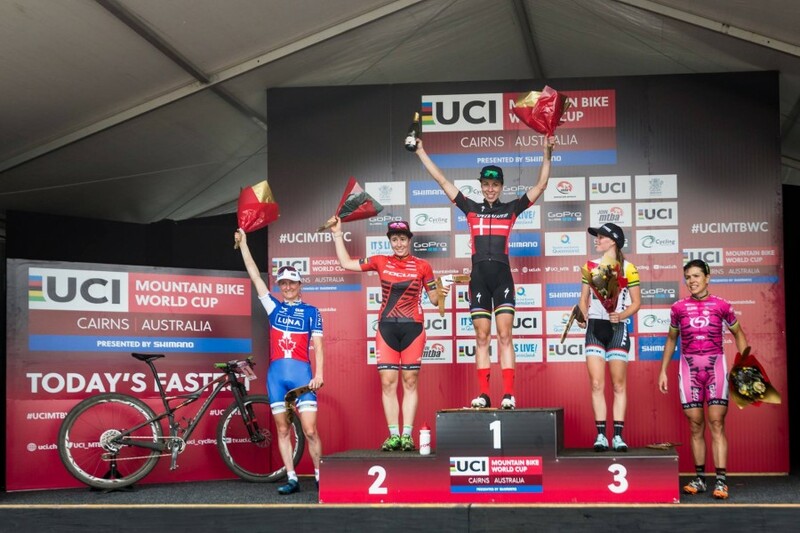 While former World Champion Catharine Pendrel looked strong, she was pipped on the final lap behind Trek Factory Racing’s Rebecca Henderson, who took 3rd place in her highest World Cup placing ever. One of the most impressive displays of the day went to former Olympic gold medallist Sabine Spitz, who at 44-years old battled the humidity and a field packed with young talent to take out 5th place. As the day wore on, the temperature continued to climb for the Elite Men’s race, while the track became dustier and dustier with every lap down. Much like the women’s field, there were more full suspension rigs than hardtails in the men’s race, and there were more than a couple of dropper posts to be seen, including the KS model spotted on Julian Absalon’s BMC Fourstroke and the Fox DOSS seen on Dan McConnell’s Procaliber. The pace was scorching from the get-go, with a lead pack made up of Mathias Flukiger, Maxime Marrot, Julian Absalon and Nino Schurter establishing control early on. Aussie hero Dan McConnell (and fellow Trek Factory Racing teammate and fiancée to Rebecca Henderson) was also driving the pace in the lead bunch, but he suffered a cruel fate on Lap 4 when a double flat ended his chances of a podium position. McConnell put in a ballsy effort to still finish in 31st. McConnell wasn’t the only one to suffer a flat however, as there were many riders throughout the day whose rims and tyres came a cropper on the many rocky sections of the XCO course. One of those riders was Julian Absalon, who flatted on the opening lap. Some significant delays in the pit zone left a frustrated Absalon fuming at his lost chances. Despite the setback, Absalon proceeded to put on a master class in XC racing, powering up the long climbs and absolutely slaying the descents thanks to the 65mm drop provided by his KS seatpost. Absalon picked off each rider one by one, clawing his way back from 39th position, to eventually cross the line in 3rd position. He finished only 27 seconds behind first place. Incredible. 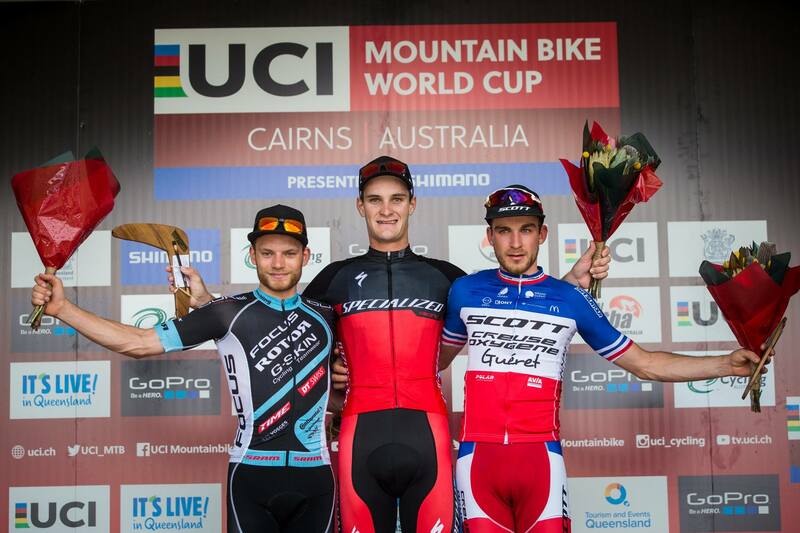 It was to be Schurter’s day though, with the Swiss rider taking his 18th World Cup win ahead of BH-Suntour team rider Maxime Marrot in 2nd. 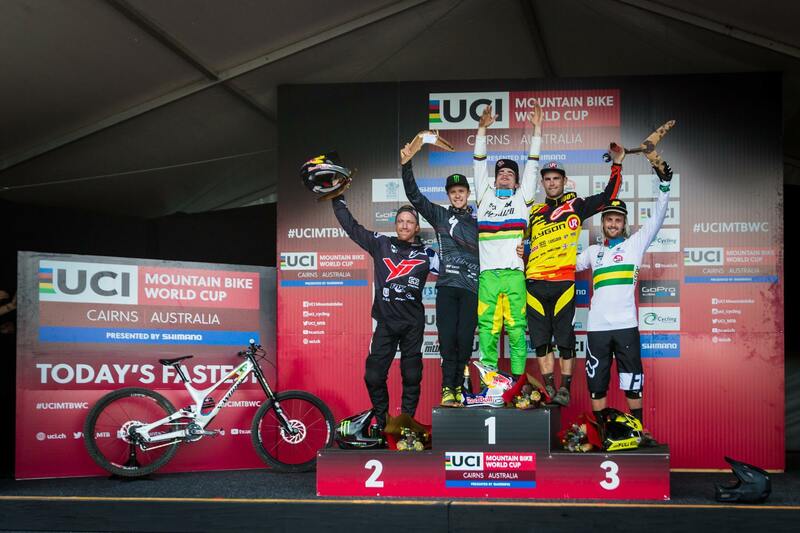 After the mud bath that was the Cairns World Cup in 2014, it was with some trepidation that the gravity set returned to the Smithfield downhill course for the 2nd round of the 2016 World Cup season. As it turned out, the track would remain in prime condition for race day, which left many of the foreign riders spending practice trying to work out how to ride the course in the dry as oppose to sticky clay. As the Cairns and Australian local, it was Polygon UR rider Tracey Hannah that spectators were hoping to see crowned as the Queen of the Jungle. With an unparalleled knowledge of the downhill course, Hannah put in a smooth and solid run to knock the 2014 World Champion Manon Carpenter off the hot seat. While Carpenter blasted down the 1.9km long course in just under four minutes, a slipped pedal meant it was Bronze for the Brit on the day. 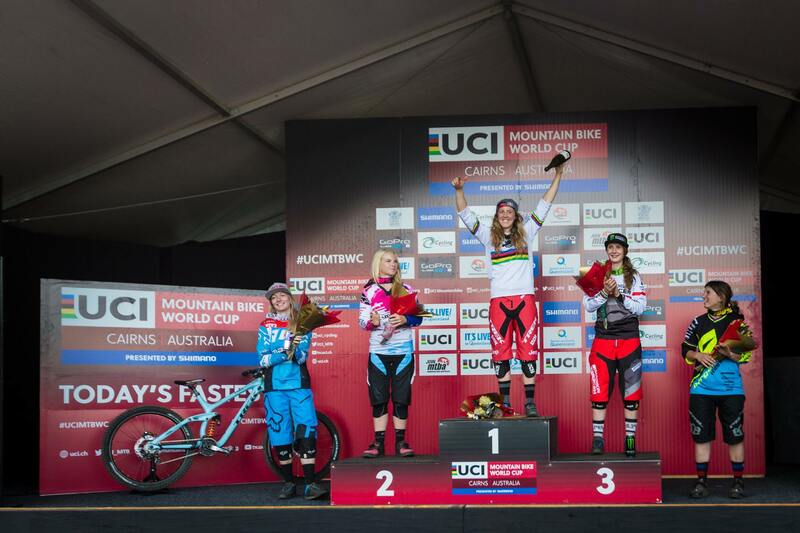 Proving once again that she is on another level all together, Trek Factory Racing’s Rachel Atherton somehow found seven seconds over Hannah to claim the top spot on the day, notching up her 28th World Cup win. Despite the track being flatter and a lot drier than the current world number one is used to, Atherton put in a flawless race run to see Britain once again on top of the podium. With much moving and shaking amongst team ranks during the off-season, it is now up to riders to let their racing do the talking. Following on from a muddy and drama-filled race at Lourdes in France back in early April, the Elite Men’s field saddled up to the start gate in Cairns for the ultimate rumble in the jungle. The downhill course in Cairns is wild. Set amongst a dense tropical rainforest, the dusty red trail surface snakes its way down the mountain range through bright green foliage to finish within spitting distance of the Great Barrier Reef. 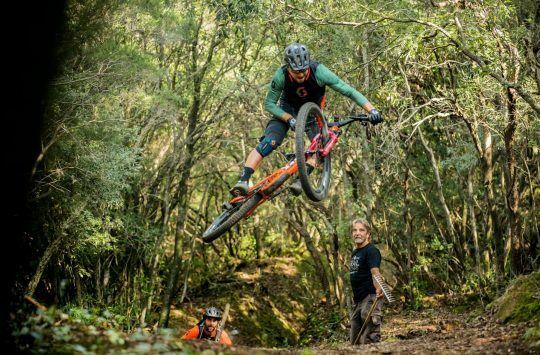 The course is littered with exposed tree roots that twist their way over the track surface, and there are gnarly rock gardens that’ll make even the bravest riders concerned about their line choices. From the top of the Cairns downhill course, riders can actually see the finish line area some 240 vertical metres below them. While many fans were expecting Aaron Gwin to dominate proceedings after his win at Lourdes, the American YT Mob rider finished outside the top three, despite crossing the line with sufficient air in both tyres and his chain intact. The Aussie contingent made up a solid chunk of the top ten, with a stellar performance from relatively unknown rider Joshua Button, who claimed the hot seat early on. Polygon UR rider and brother to Tracey Hannah, Mick Hannah delivered a confident race run that saw the Cairns local nab 3rd place on the day. For a rider who is entering his 15th World Cup season, Hannah’s podium finish in his hometown was just the motivation he needs leading into the 2016 race season. While Specialized’s Troy Brosnan was looking ridiculously fast and comfortable all weekend, his super smooth ride wasn’t quite enough on the day, coming agonisingly close with the 2nd fastest time for the Elite field. He was beaten by another young rider on a Specialized Demo, Loic Bruni, who won his very first World Cup race after claiming the World Championship in 2015. Bruni edged out Brosnan by less than half a second, highlighting the quality of racing on the World Cup stage. It was an off-day for some of the other big names on the DH circuit, with Gee Atherton finishing back in 22nd, Josh Brycleand taking 20th, and fellow Santa Cruz Syndicate rider Greg Minaar managing a 17th position. But for those riders who didn’t find success in Australia, there is plenty of time to recover and get the training on point for the next round of World Cup racing. Next up, Albstadt in Germany on the 21st and 22nd of May! A dropper post used in a UCI XC race? Not worth mentioning in the coverage of the event? Sabine Spitz is pretty amazing at 44 and still up there on the podium.